This Craftsman home was recently built by Southgate Homes. There are upgrades galore! No expense has been spared. Beautiful front porch with flagstone patio & double entry doors add to the attractive curb appeal. 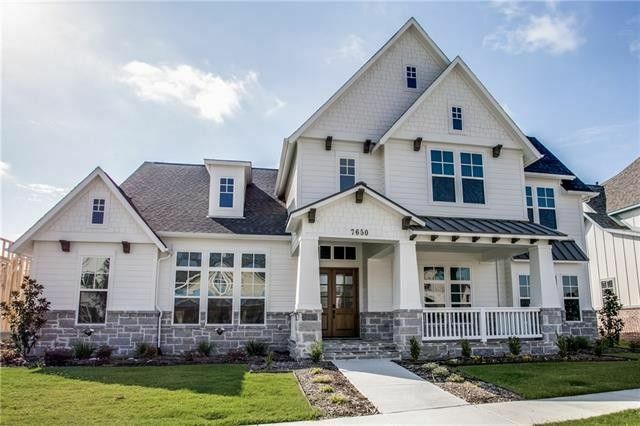 Dramatic two story entry with modern hanging light fixture greet you& is flanked by large formal dining room & study with solid sliding door plus closet with shelves for storage. Extended entry leads to open staircase with custom railing. Gourmet kitchen has a huge quartz island & miles of countertop plus built-in refrigerator, six-burner gas range with griddle & butler's pantry that leads to 8-foot deep fabulous pantry. Main Living area has beamed vaulted ceiling & dramatic floor to ceiling fireplace. Directions: Dallas North Tollway to Cotton Gin Road, left on Cotton Gin road, left on Legacy, right on Diamond Point, right on Cassion Drive. 7650 is second home on right.